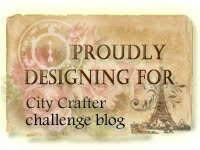 This week's Make My Monday challenge is Fairies/Mystical . For my card I created a background using inks and torn paper and a punch out circle for the moon. What you can't see in the photo is that I masked the background and sprayed the moon with glitter spray, so it does have some sparkle. 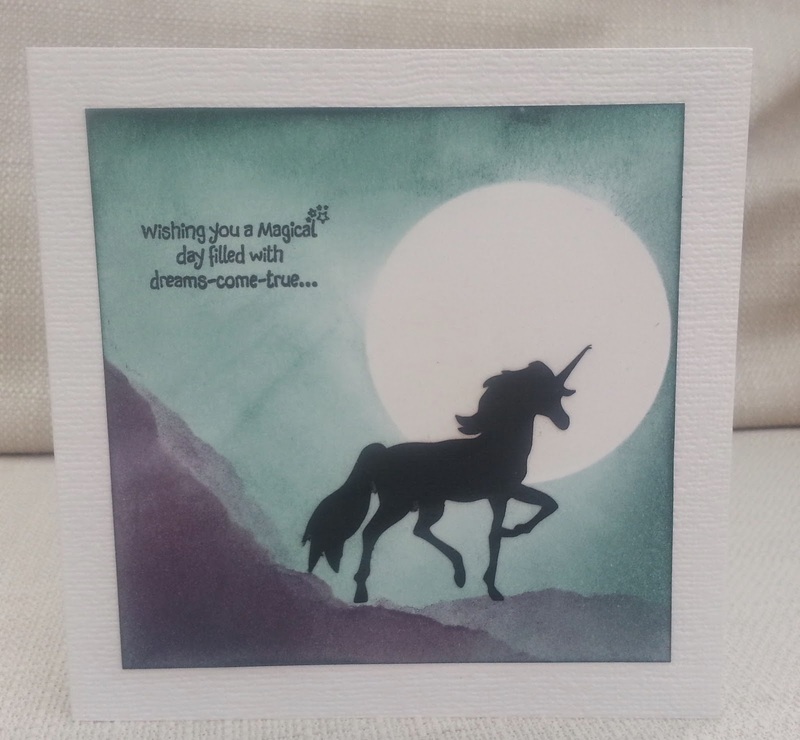 I googled for a silhouette image of a unicorn and traced it and cut it with my Silhouette cutting machine. 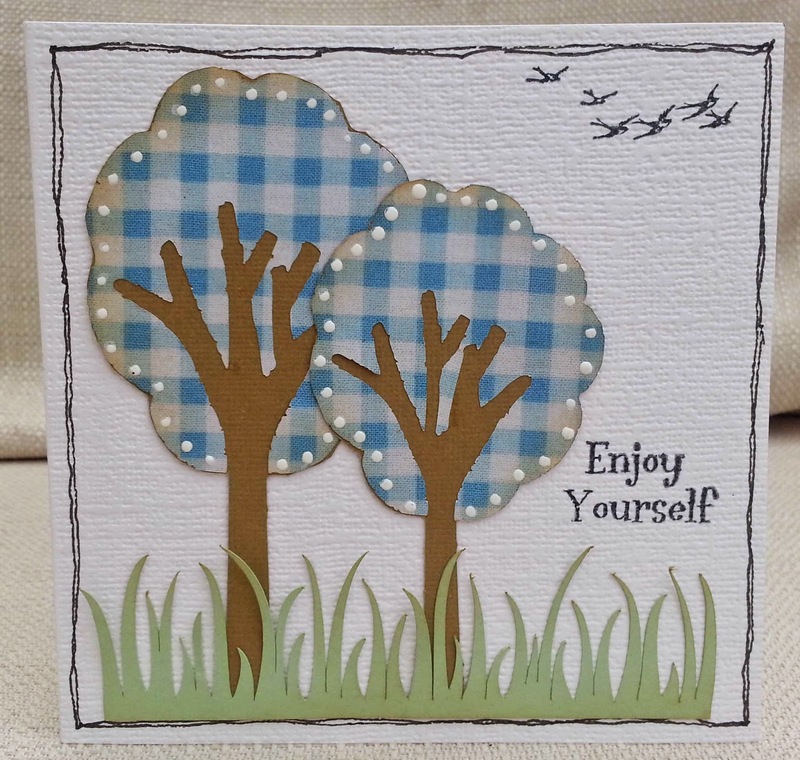 The sentiment is a stamp from Docrafts. I hope you'll join us over at Make My Monday. 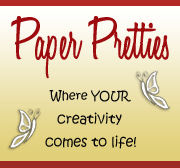 I couldn't resist this quirky stamp from Crafty Individuals. 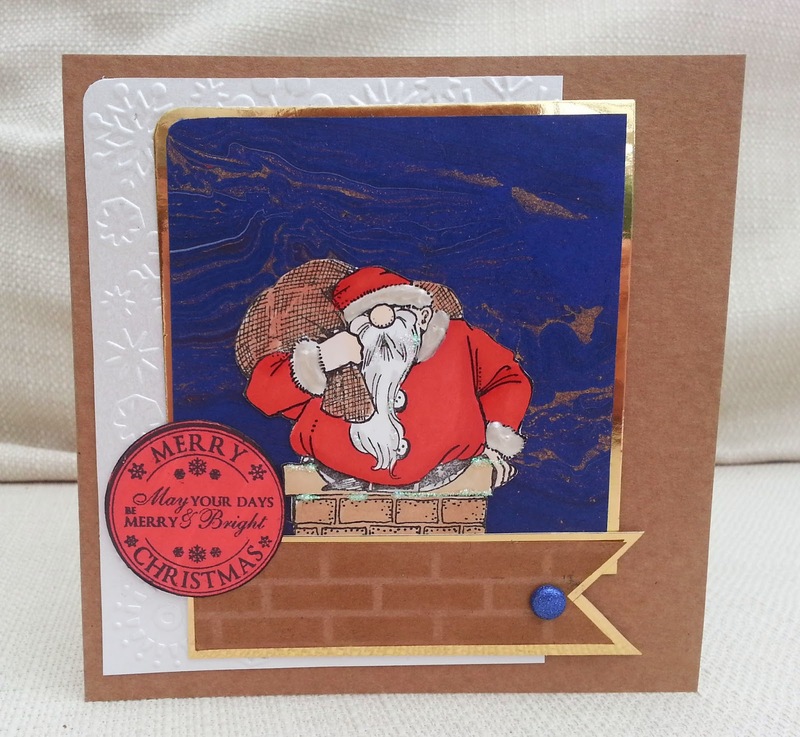 I stamped it in black and then coloured it with aqua and brown ink. 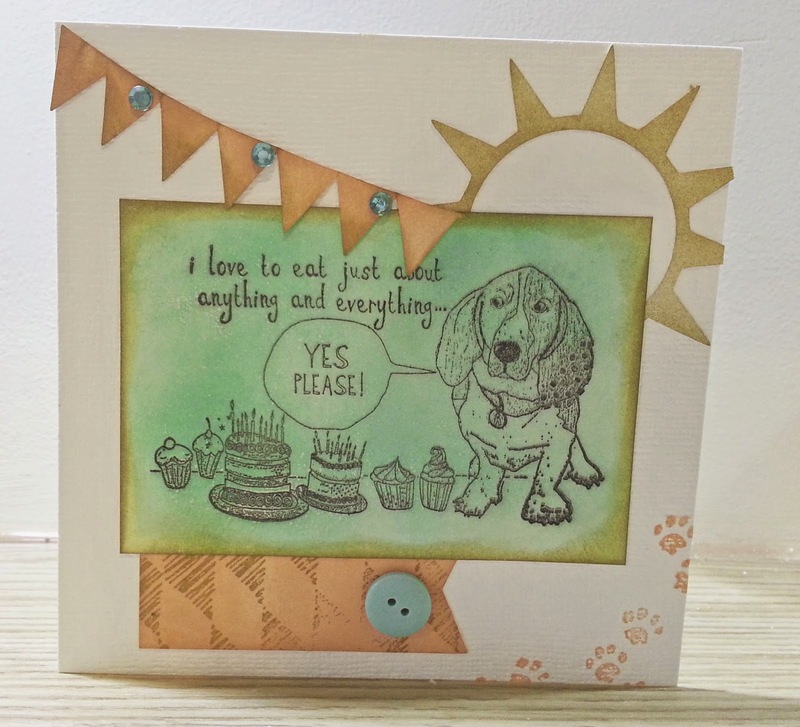 I coloured some die-cut elements with ink, stamped the banner with a harlequin design and added gems, a button and paw prints. I'm having some trouble with photographing in artificial light. That's because I made this using the Come and Get It colour scheme of Pool Party, Baked Brown Sugar and Calypso Coral , and then realised I had nearly missed the deadline! The button is actually very close in colour to the 'Pool Party' ink used on the central panel. Festive 48 - Week 24 - Halfway There! Hooray! - I'm halfway towards my goal of 48 Christmas cards. I was having a bit of a sort out of some old stuff I'd got free from magazines and found some uncut decoupage sheets. Most of them were not to my taste and ended up in the kid's craft box, but I quite liked this one. After three layers of decoupage, I die- cut into an oval and added lots of background papers and glitter. 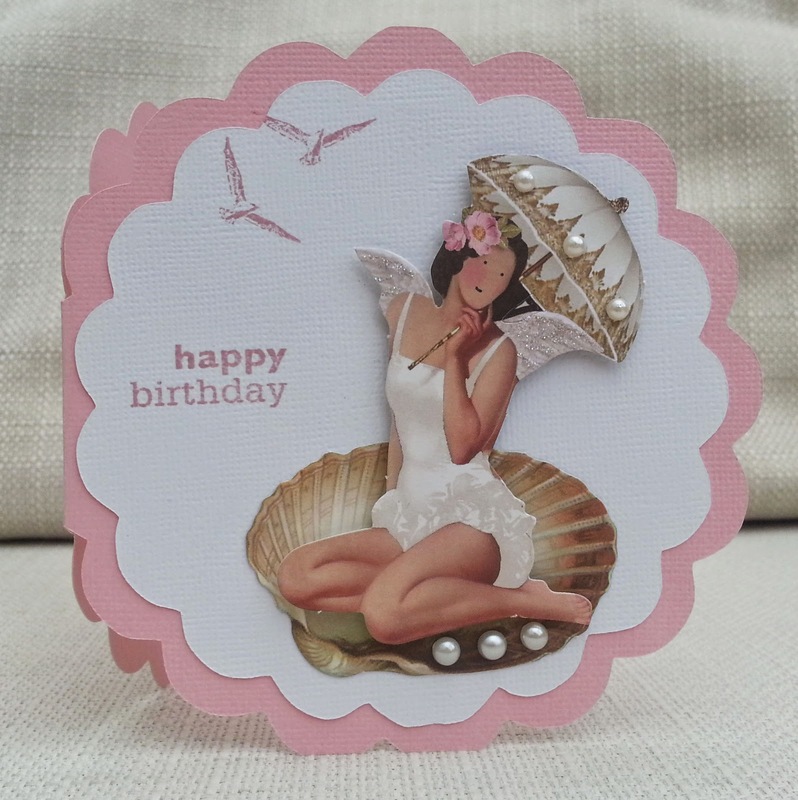 The fairy and the shell are die-cuts from a Tilda paper pad called 'Seaside Life'. The first thing I did was to draw a mouth on the fairy as that's my quirk - I don't like images without mouths! I sat the fairy on the shell using 3d foam. I made a scalloped circle card on the Silhouette and stamped the sentiment and seagulls. I added pearls and glitter. 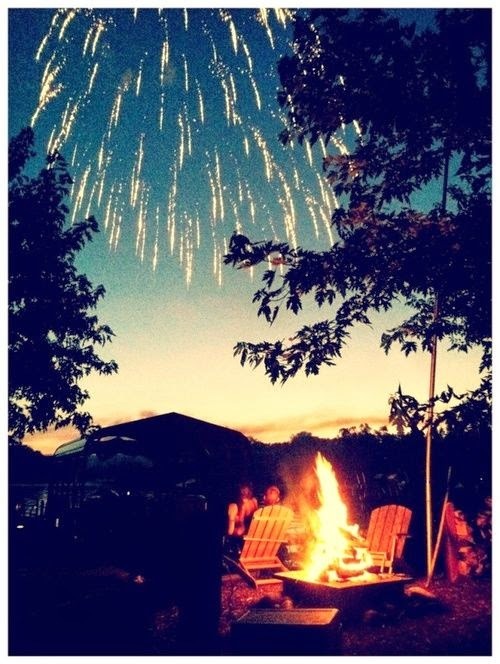 This picture made me think of the outdoor events we enjoy in summer and for me, the highlights are outdoor concerts and music festivals. 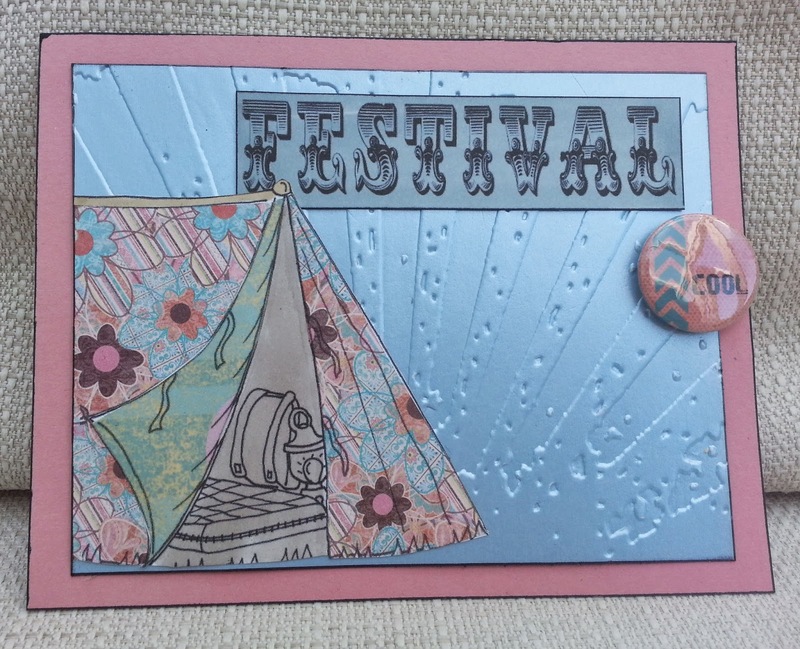 I used the tent image, kindly provided by our sponsor Paper Pretties and I paper-pieced it with two patterned papers. I used a Sizzix embossing folder and made the word 'Festival' on my computer. I added a flair badge. At Pinspirational we have great sponsors offering prizes, so please do come and join us. This week's challenge at Make My Monday is anniversaries. In September, I celebrate 10 years since I bravely gave up my own flat and moved in with my partner, so I made a card for that. 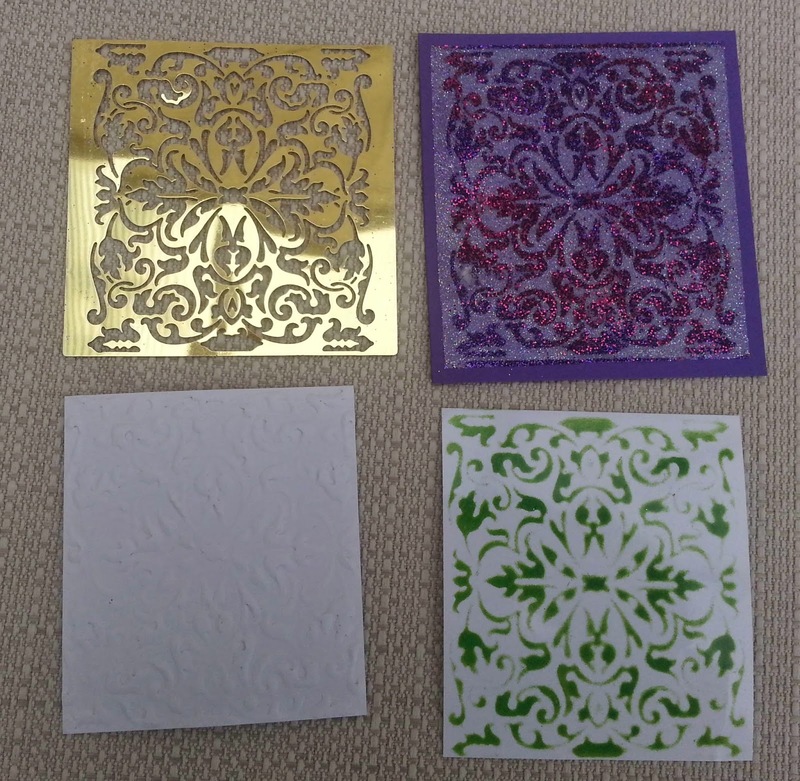 I used one sheet of 12 x 12 card - one side is pearlised and I created the design on the Silhouette Cameo using basic shapes. 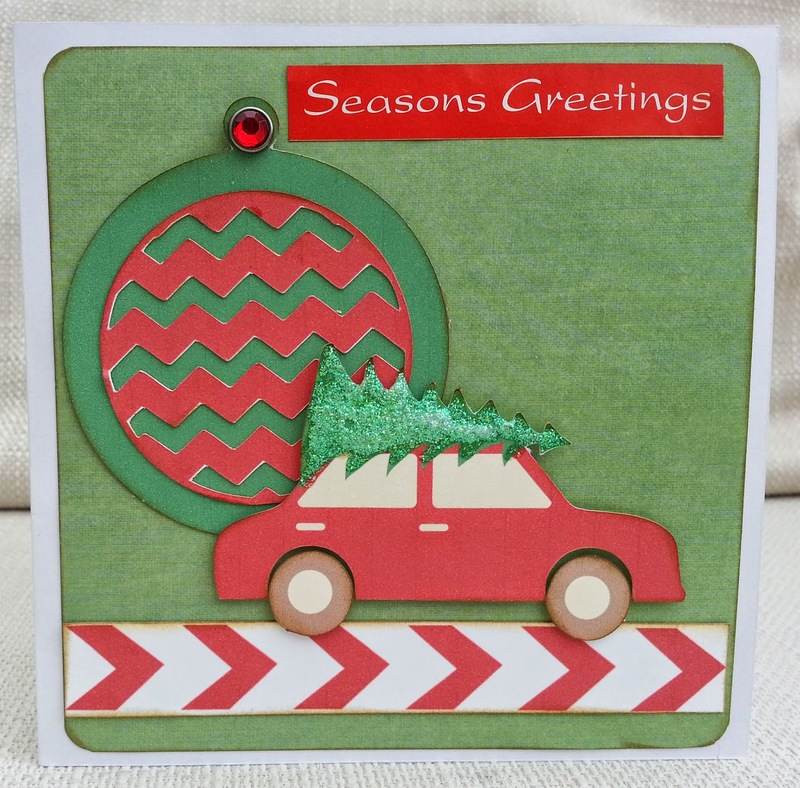 Then I used an embossing folder to emboss the pearlised elements , inked the edges and added some gems. What anniversaries are you celebrating this year? Come and join us at Make My Monday. My seven-year-old son is no angel! He does need encouragement to behave himself. 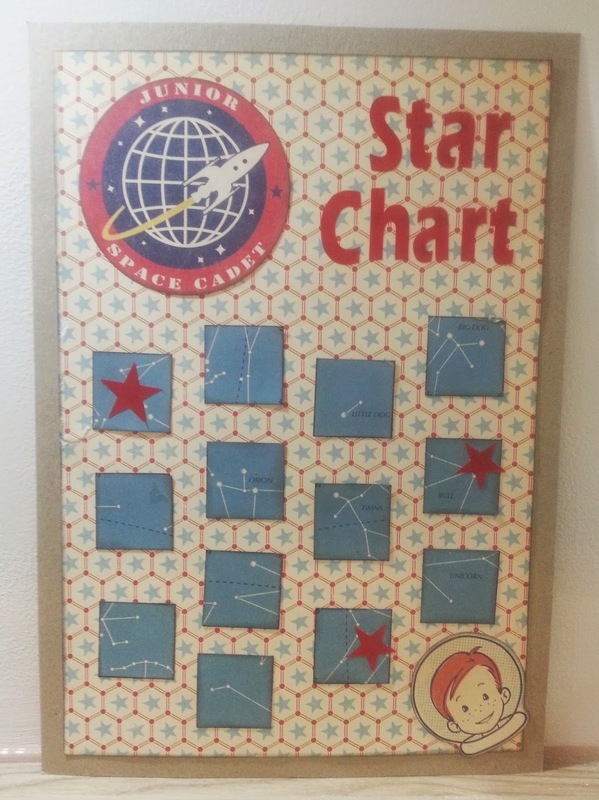 This is a new reward chart I've made him - when every one of the blue squares has a red star, he gets a reward. ( He's earned 3 already). I used the leftovers from some October Afternoon Rocket Age papers and stickers, and I inked all the edges in black. The title and the stars were cut out of red vinyl on the Silhouette Cameo. Let me tell you about my daughter. Five years ago, when she already had a four-year-old child, she decided to train to be a midwife. The final three years were a degree where, not only has she had to write essays and a dissertation, but also to work in clinics and hospitals, including grueling night shifts. In her second year of study, she gave birth, prematurely and by emergency caesarean,and her baby was in special care for a while. 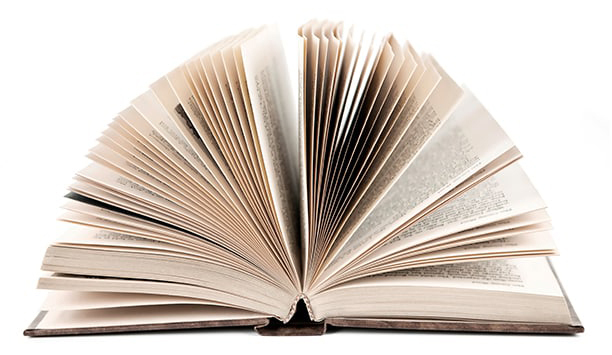 But she coped with this, got back to study and she is now completing her course and will graduate in summer. The temptation was to try to make a spectacular card with bells and sparkles - but instead, I decided to focus on the sentiment and keep it clean and simple. The peacock feather is a digital stamp from a Craft Artist digikit called wings and feathers. 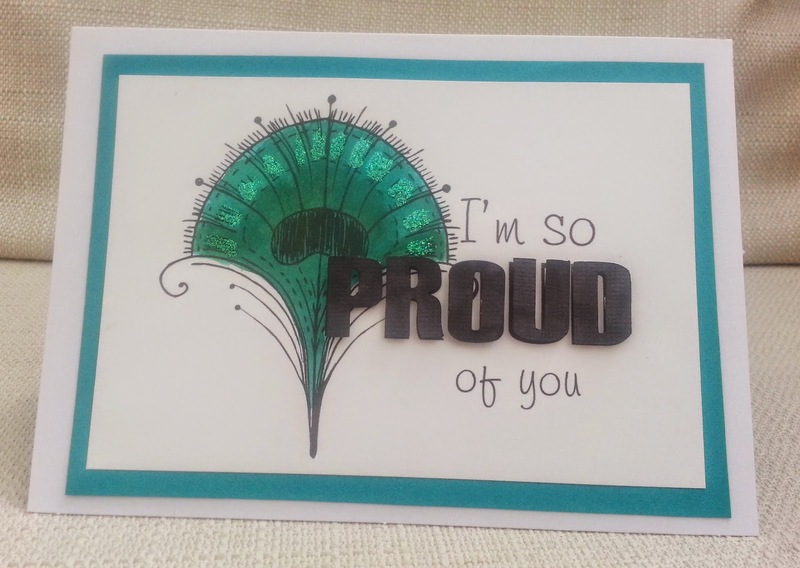 I designed the sentiment in Craft Artist, printed it and watercoloured the feather with a mix of Peacock Distress Ink and golden jade Twinkling H20s. I cut the word 'Proud' on the Silhouette and stuck it on with 3d foam. I added glitter glue. Simply Create Too sentiment is the highlight. 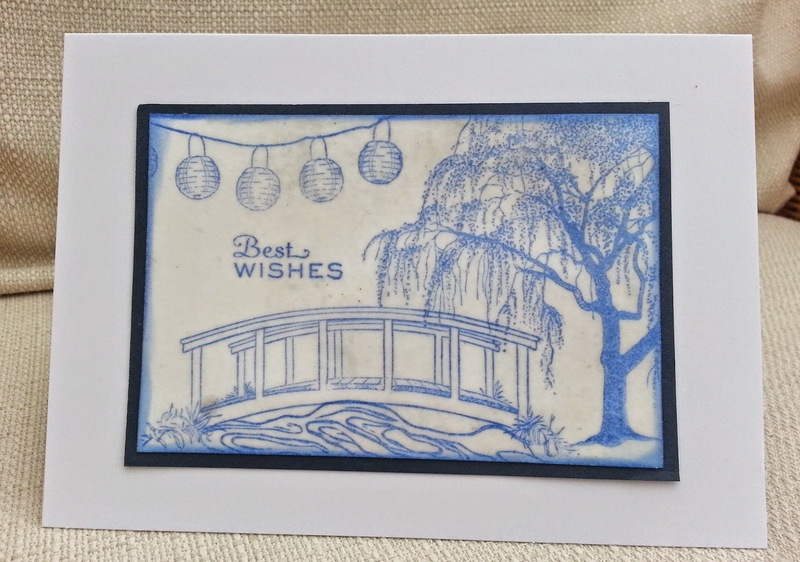 All the stamps here, (except the sentiment) , are from Sheena Douglass's oriental range . As a child, I remember hearing the story of the pictures on Willow Pattern china plates, and quite enjoying it. (I think there were some runaway lovers involved!) I wanted to get the feel of old china on my card, so, after composing the image, I triple embossed the whole panel in clear embossing powder. 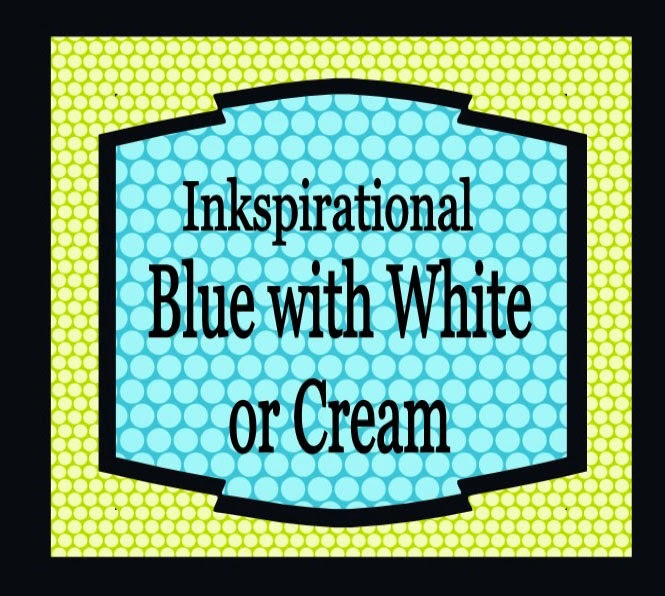 Anyway, our challenge is 'blue and white/cream' and we have a wonderful guest designer Laura, so I hope you will come and have a look and join in. Trying to show the sparkles! I've noticed a few challenges with a 'fairy' theme and wanted to join in...but have only had chance to get on with it tonight and nearly run out of time to enter on some! 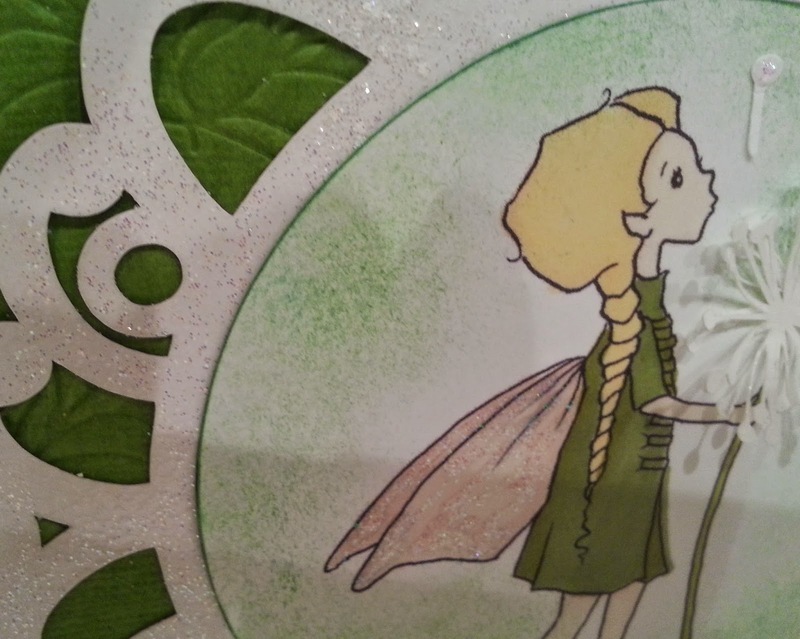 The fairy is a digi from A Day for Daisies , and the frame and dandelion were cut on the Silhouette. 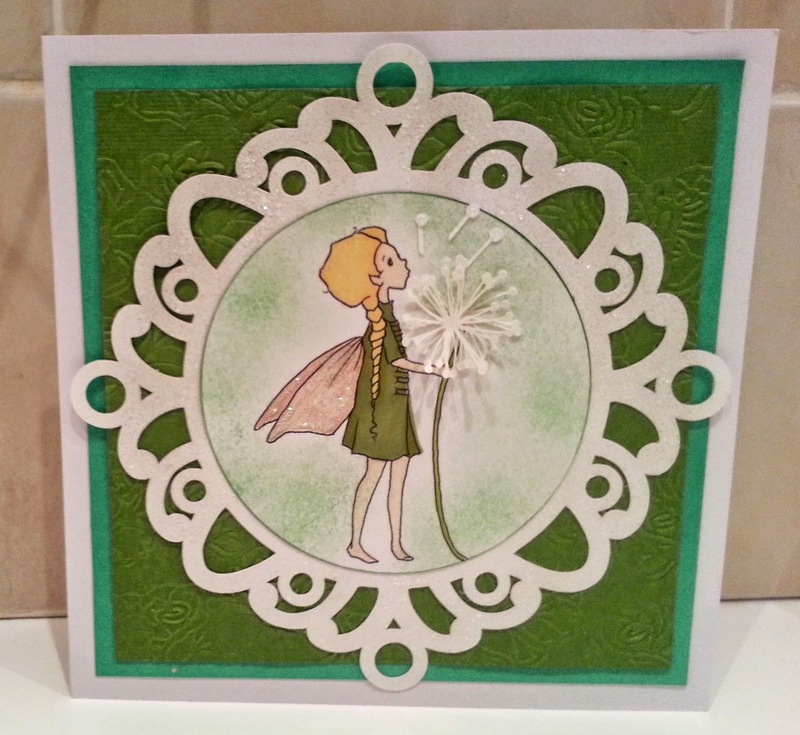 I used three white 'frantage' powders on the frame, Stickles on the wings and glitter spray on the dandelion, so the card is really sparkly in real life. 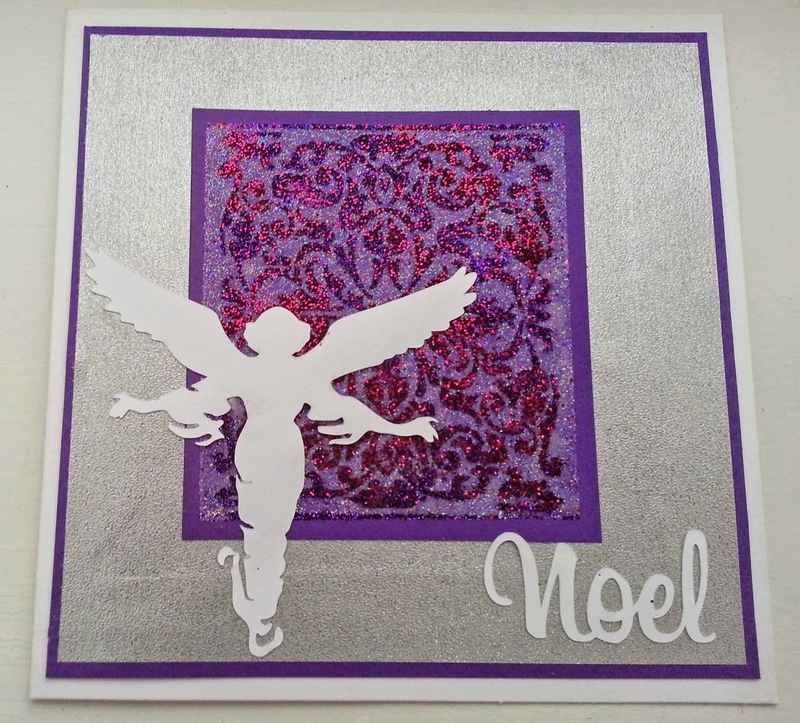 I embossed the background with an Embossalicious folder. 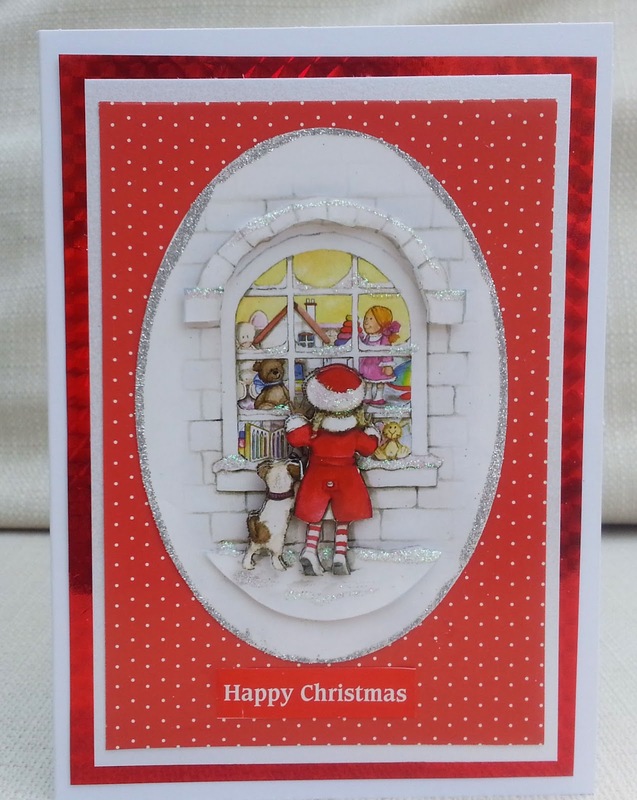 Well, fellow crafters, you will be proud to hear that the hot weather we currently have in the UK has not deterred me from my Christmas card-making goal! Here is a partridge in a pear tree. The partridge is a digistamp by The Alley Way. I diecut the arch, coloured it with distress ink and gold embossed with a chickenwire stamp. The spiral pear is a diecut and the music background is a mask. 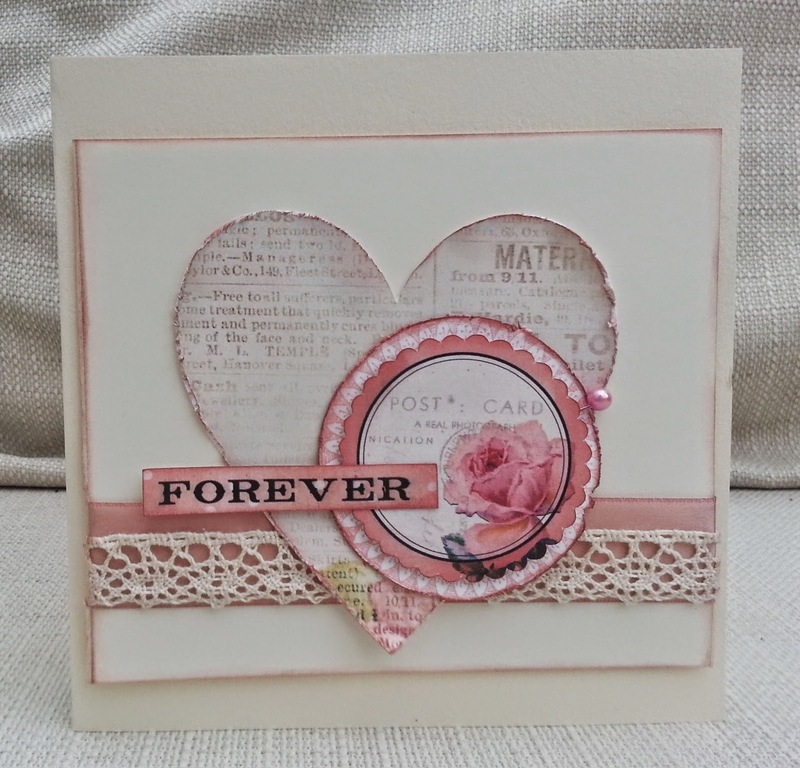 This week's Make My Monday challenge is 'Pretty in Pink'. I made this card for my daughter, who requested a vintage pink card for her friend's wedding. I die cut the elements from a Glitz digi-kit and inked, distressed and layered them. I coloured the ribbon and layered it with lace. I hope you'll come over to Make My Monday and join us. It's the weekend! I'm hoping for another lovely sunny day now that I can enjoy it, rather than being shut in at work. The girl is by A Day For Daisies and I coloured her with Promarkers and paper-pieced her clothes. The green frame is a Kanban stamp. 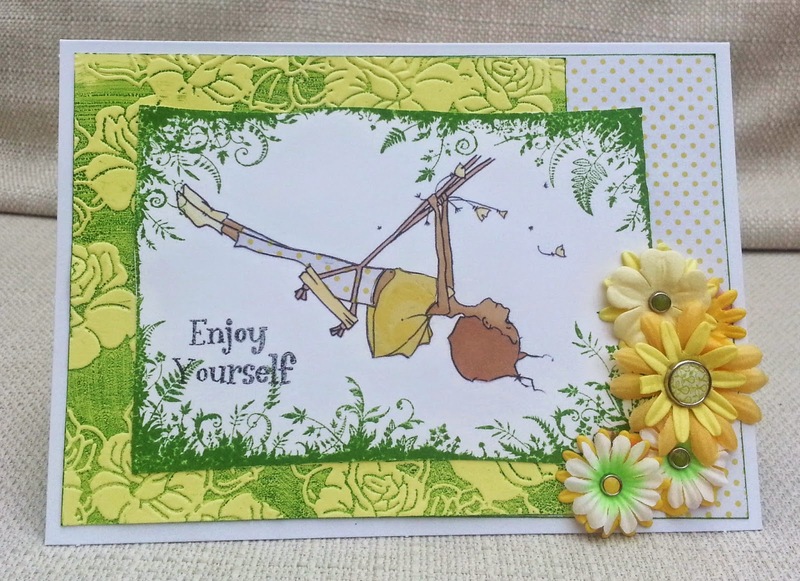 I also used an Embossabilities folder smeared in green ink and the sentiment stamp. For this week's Christmas card, I used a sketch from Mojo Monday . The stamp is a very old one from Personal Impressions and I coloured it with Promarkers, Liquid Pearl and Stickles. The sentiment is LOTV and the brickwork on the banner was done with a stencil. I made a notebook for my friend using a First Edition paper pad designed by Jessica Hogarth and named 'Man Made' (although the friend I made the book for is a woman!) . I really love the houses paper (which has a fabric texture) and so wanted to use the scraps , as I've done here. The man on the bike was cut on the Silhouette. The truck with the dog was a print and cut I did a while back and hadn't used, but I thought it would be cute to put in the background. 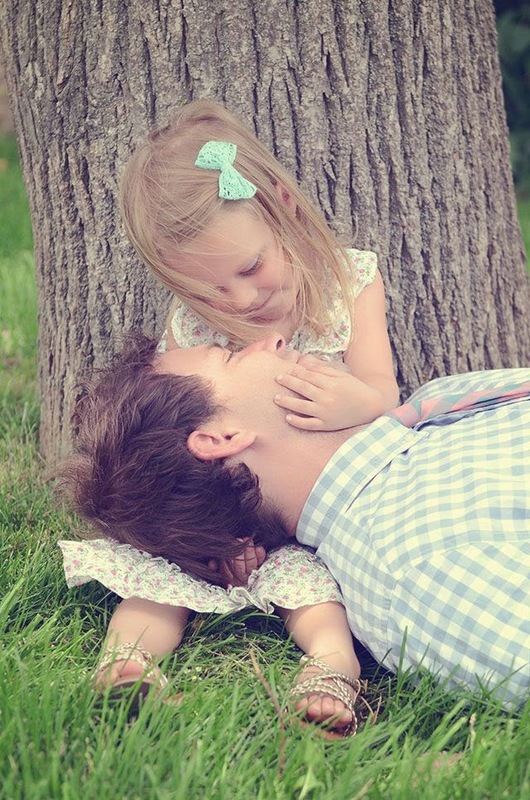 For my DT card, I picked out the tree and the gingham in the dad's shirt. I used a tree digi, kindly provided by our sponsors Sweet n Sassy . I added liquid pearls, bird and sentiment stamps and a doodled border. I hope the picture gives you some ideas ( father's day?) and you come over to Pinspirational to join us . We have great prizes to be won. I know not all men like cars. But some do - a LOT. I suspect my young son may grow up to be one of them. His favourite TV programme is about renovating old cars , and he's only seven. 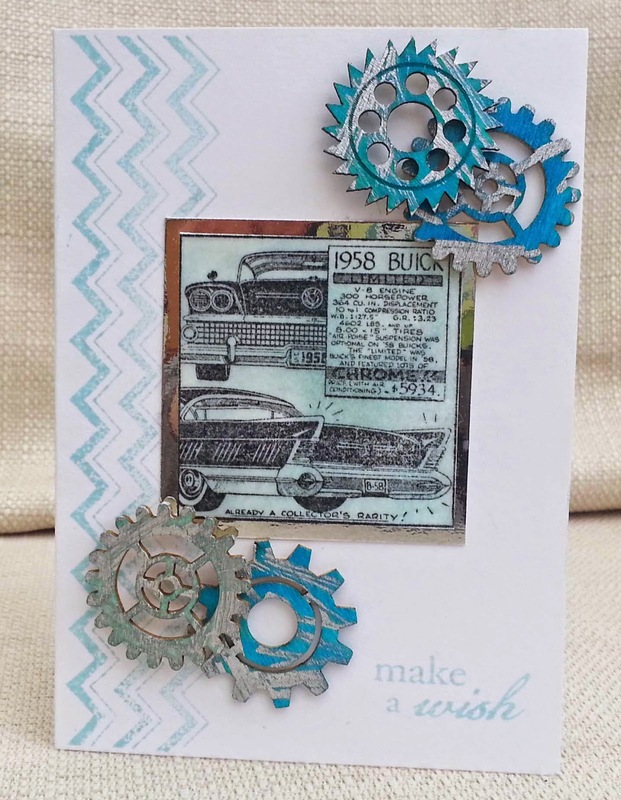 This is my DT card for this week's Make my Monday challenge, which is to make a card for a man. I used a BLine stamp , which I coloured with ink and mounted on silver. The chevrons are Lawn Fawn(?) and the gears were given to me by June who organises the crop I go to. I coloured them with Cosmic Shimmer mist and Krylon silver pen. 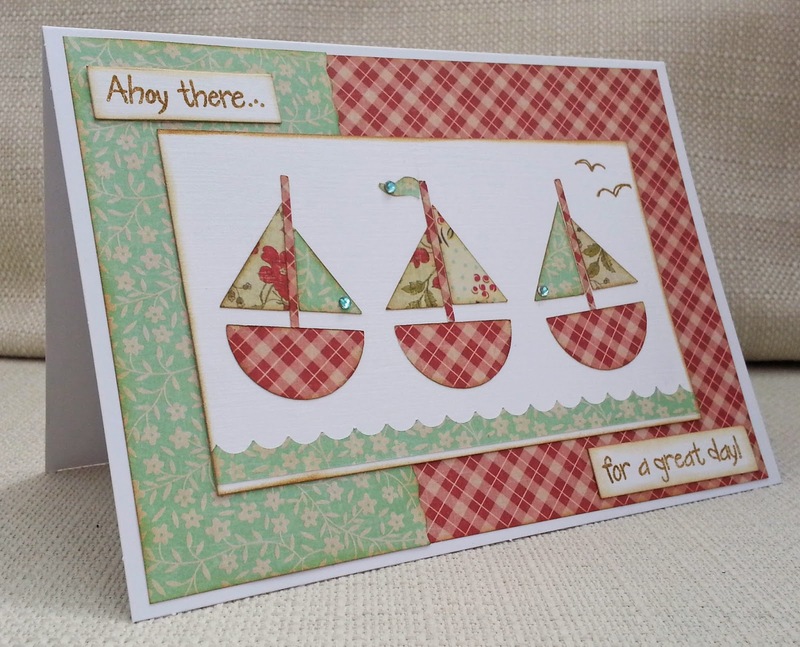 I usually think of 'nautical' cards as being quite masculine, so I wanted to do one with a more feminine feel. The boats were an SVG electronic cutter file, and I cut them out of 4 different patterned papers from a set that came free with a magazine. I inked everything and pieced them together, stamping some birds and the sentiment, (Woodware). I added some gems to the flag and sails. 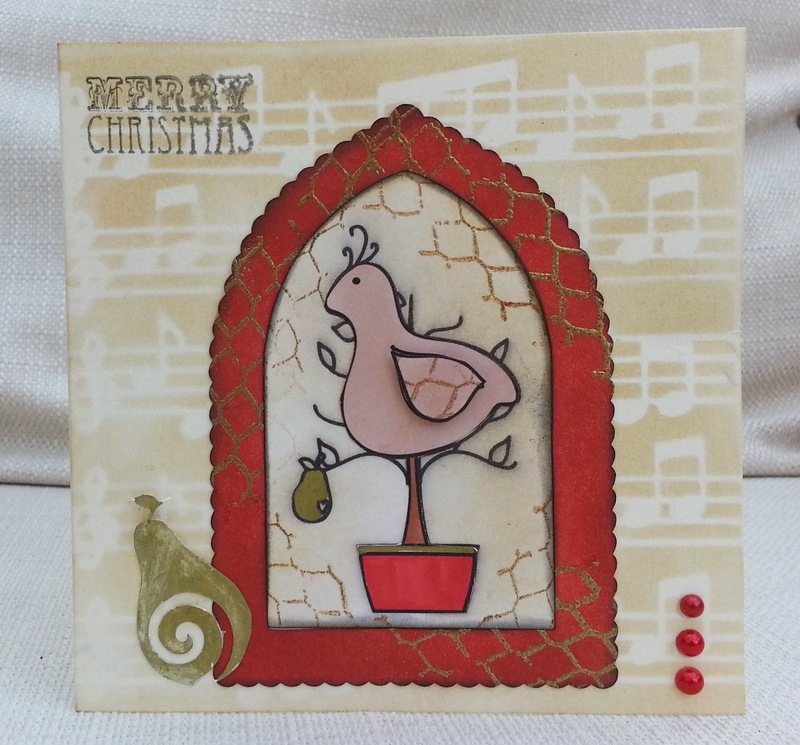 The vintage image here is from Joanna Sheen Cardmaker's Year CD. The bingo card was printed from a digi kit (Design by Dani). The bucket and spade are from My Craft Studio 'Days Out' CD- I traced them and cut them with the Silhouette. 'Bon Voyage' is a scrap of washi tape and the shell is by mother nature! Do not adjust your screen! This is supposed to have a slightly blurred look. Why? Well our theme at Inkspirational (chosen by Sandie ) is CAS and , as this is not my usual style, I just wanted to do something a bit different. 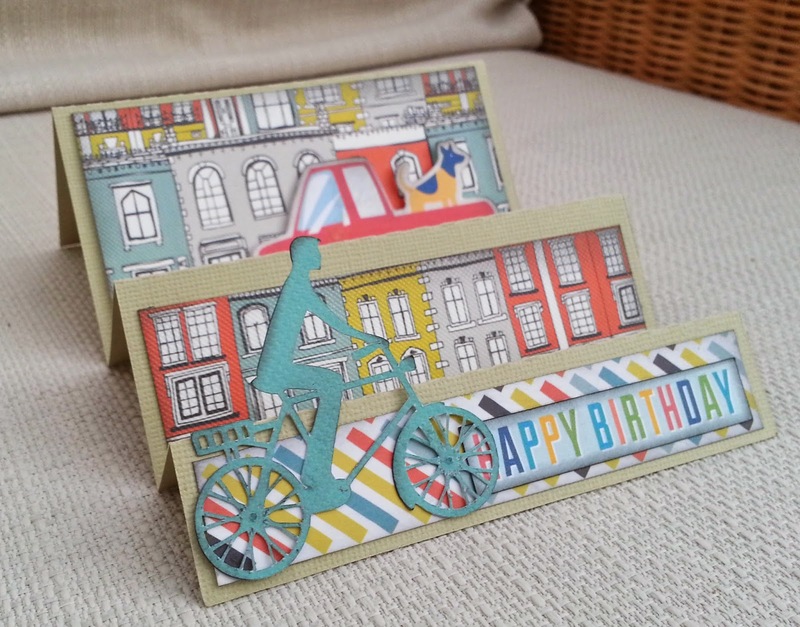 So, I've made a one-layer-card , using two sets of Claudine Hellmuth stamps that are made to go together. 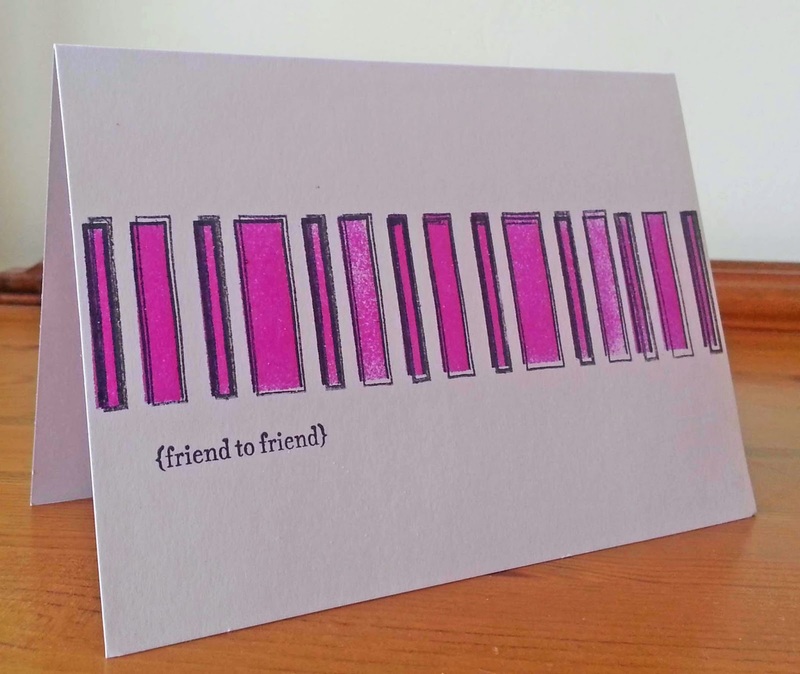 First I used the foam stamp to stamp pink shapes , repeating to the edge of the card. Then I used the acrylic outline stamp in black - first I stamped it exactly as an outline, then I stamped again, just slightly offset. The sentiment is Stampin Up. 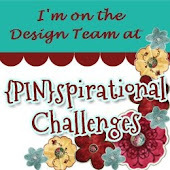 Come and see what the Inkspirational DT , and our Guest Designer Sue, have made and join our challenge. I'm trying to take a 'use it or lose it ' approach to my stash now - finding things I have barely used and either using them or getting rid of them. I found an Anna Griffin stencil - I don't even know where it came from - and thought I'd experiment with it. 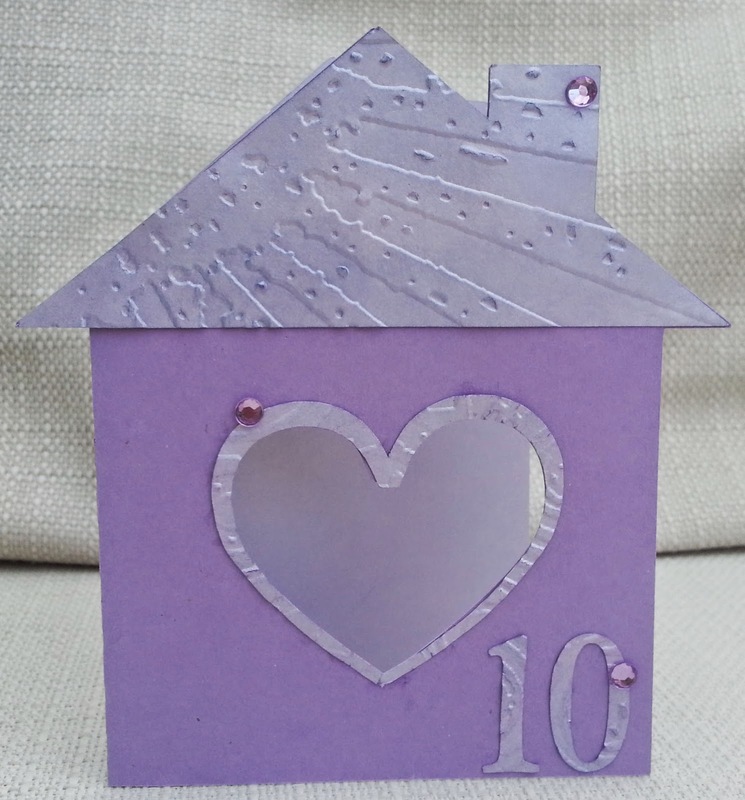 The glittery panel was made using double-sided adhesive sheets (another 'use it or lose it' item). I sprinkled two colours of glitter through the stencil, took away the stencil and covered it all with irridiscent glitter. The angel was a silhouette I found online which I traced and cut on the Silhouette. This link up is always 'Anything Christmas Goes'. This week at Make My Monday we have a wedding theme. I cut the champagne bottle and hearts on my Silhouette electronic cutter and then I embossed the gold card in my Big Shot. 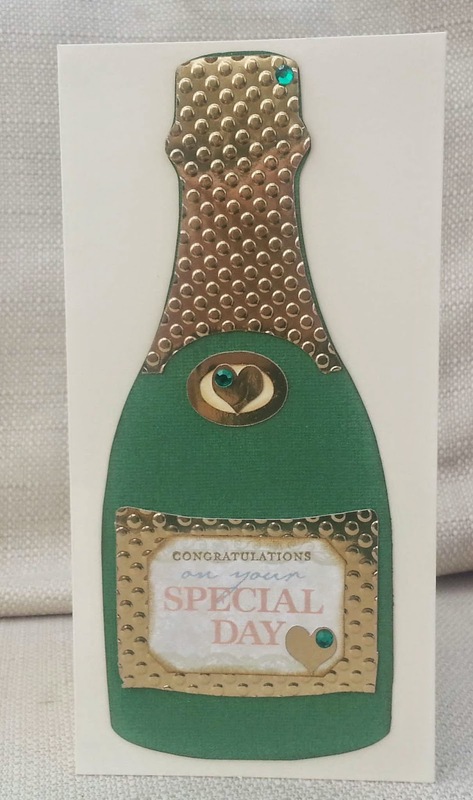 The label was a printed die-cut by Papermania and I stamped 'congratulations' onto it. It's the 'wedding season' now so the perfect time to get a wedding card made and link it up at Make My Monday.